Bishop Nicholas DiMarzio will ordain 10 men to the priesthood for the Diocese of Brooklyn at St. Joseph’s Co-Cathedral, Prospect Heights, on Saturday, June 3, at 11 a.m. The average age of the ordinands is 33 years. Three were born in Brooklyn. Two come from Poland and two from Nigeria. One was born in Korea, Cameroon and Italy. They come from various backgrounds. One played in a rock band and hopes to rely on the power of music in his ministry. One was a social worker. One, a mapmaker. Another, a bricklayer. The diocesan network New Evangelization Television (NET TV) will provide live coverage of the Ordination Mass, which will also be live streamed on www.netny.tv. NET TV is a cable network featuring news and information with a Catholic point of view, and is available in the New York area on Time Warner Cable, Channel 97; Cablevision, Channel 30; and Channel 48 on Verizon FiOS On Demand. Below are brief biographies of the ordinands with details of their roads to the priesthood and plans for their First Masses of thanksgiving. The pieces were written by Tablet reporters Marie Elena Giossi and Antonina Zielinska. 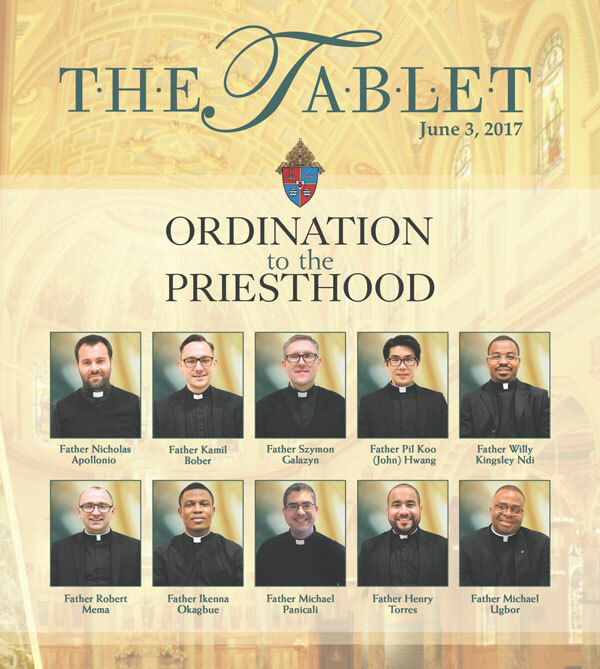 In the U.S., the total number of potential ordinands for the priesthood in 2017 is 590, including 10 from the Diocese of Brooklyn. This year’s number of ordinands is slightly up from 548 in 2016 and down from 595 in 2015. Polish-born Father Szymon Galazyn, 35, did not expect to end up in the United States. When Father Willy Kingsley Ndi, 31, was a child in Cameroon, Africa, he fell in love with sacred things. Growing up as a nominal Catholic, Father Robert H.C. Mema, 28, never thought about becoming a priest until he journeyed through the Rite of Christian Initiation of Adults. Seeing the holiness and humanity of his parish priests as a child inspired Father Ikenna Okagbue, 35, to consider priesthood for himself.